Hosted by the members of Students Participating in Transcendent Knowledge (S.P.I.T. 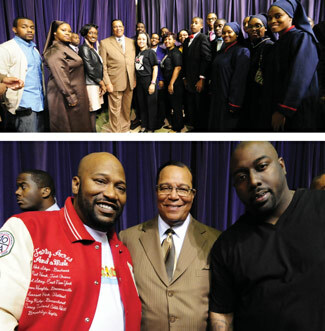 Knowledge) and the Nation of Islam Student Association, the arena was filled with students from Prairie View A&M as well as Texas Southern University, whose students chartered a bus and made the hour-long road trip to hear his message. Lines stretched down the street in front of the arena as waves of young college students flowed through turnstiles until the arena reached capacity. For many of the students, it was the first time they heard the Minister speak live and in person. Minister Farrakhan talked to the students about their potential power, noting few human beings— though created in God’s image and likeness—are manifesting the attributes and characteristics of God. Even though humans are referred to in the scriptures as “the glory of God,” many fail to recognize the divinity that exists within. God has never created anything that is mediocre, he said. The Minister pointed out that ever since the 1940s starting with the organizing efforts of A. Phillip Randolph, Blacks have marched for jobs and justice. At the March on Washington in 1963 when Rev. Dr. Martin Luther King Jr. delivered his “I Have a Dream” speech, the cry was for jobs and justice. In 1983 at the 20th anniversary, organizers were still asking for jobs and justice, and just a few weeks ago, at the dedication of the MLK Memorial in Washington D.C., Rev. Al Sharpton led a march and the cry was again for jobs and justice. Black people have prayed in, sat in, begged and pleaded to be allowed into politics and business in White society, yet nothing has been done that has significantly benefited the masses of Black people. “Shouldn’t it dawn on you that something is wrong with that picture?” he asked. The Minister said there was “full employment” during slavery, and following slavery, Blacks were builders and artisans. Additionally, Black people built over 60 Black towns in America, mansions for Whites along with many of the country’s well-known monuments such as the White House. “How could you be a builder like that for somebody else and now all of a sudden, you don’t know how to build anything for yourself? Despite all of those who have majored in sociology, economics, psychology and doctors, they are unable to solve the problems plaguing humanity, and despite President Barack H. Obama’s stated desire to create jobs, the chances of those jobs going to Black people are very slim. It is unfair and “tragic” to place that burden on President Obama, the Minister said. The solution is for Black people to unite and pool their financial resources to buy land to provide resources to create products and jobs. He also suggested anyone majoring in sociology or psychology should change his or her major right away. President Obama is running corporate America, said the Minister. While he was campaigning for the Oval Office, he may not have understood the unseen forces that guide the affairs of the nation and the world. President Obama is a constitutional lawyer, but not an economist. He said he was going to bring change, but when he got into office, Mr. Obama surrounded himself with the same Wall Street “robber barons” who through “wicked schemes of banks” caused America to descend into the current financial quagmire. Advisors told the president a stimulus package was needed. Despite the fact that America was built on the backs of the poor, and the middle class is shrinking and suffering, decisions are being made that primarily benefit the wealthy. He gave the example of the Federal Reserve Bank recently printing $16 trillion and distributing it to banks and corporations in Europe and America without President Obama’s knowledge, he said. President Obama’s advisers also tell him to continue financial aid to Israel to the tune of $3 billion annually, despite America’s mounting debt crisis, and to make matters worse, a muscular pro-Israel lobby exerts inordinate influence on America’s foreign policy. Out of fear of retaliation from Zionists, also called “Israel firsters,” very few elected officials speak any words critical of Israel’s misbehavior and continue to blindly back America’s expanding military presence through several foreign wars. Minister Farrakhan has always encouraged members of the Nation of Islam to become computer savvy and to adopt new technologies that will lead to an improvement in their lives. Over the past few months, the Minister has embraced the latest technological innovations himself. He has been seen regularly toting around his Apple iPad, utilizing his stylus to make notations while viewing content by means of its auto-rotate screen feature. He also has a popular and very active Twitter feed. The Minister frequently answers questions submitted via Twitter by those following him using the social networking tool. Continuing along that line, following the Minister’s inspirational message to the students, several questions submitted using that method were read by The Final Call’s Jesse Muhammad. Along with being a Prairie View A&M alum, Mr. Muhammad was instrumental in coordinating the Minister’s campus appearance working with the university’s students and administrators. The first question presented to the Minister dealt with the prison industrial complex. Many Black men and women have been caught in that trap, however, by striving to display righteous conduct and behavior, it can be avoided, Minister Farrakhan said. “Stay out of prison,” said the Minister. “You’re being trapped into a life of crime. When there are no jobs or opportunities, there’s always crime and the sales of drugs,” he added. Another question asked about Minister Farrakhan’s relationship with Malcolm X. The Minister patiently answered the question providing guidance on several different levels. He then addressed the thoroughly discredited and wicked notion that he was in some way involved in the murder of Malcolm X. “I’m saddened over what has happened in the Nation of Islam between us and our brother, but those are wounds that I pray that God will help us to heal. The enemy is so frightened that Black people listen to Farrakhan that they put it out that Farrakhan had something to do with the murder of Malcolm X. This is how wicked the media is,” Min. Farrakhan said. “Don’t you know as much as they hate me, if they had any proof that I did something like that, don’t you know they would take me off the street in the twinkling of an eye and bury me under the jail?” Many in the audience nodded in affirmation and agreement. “I had nothing to do with my brother’s death, but I am what I am because I am a good student. I learned a lot from Brother Malcolm, but the teacher of both Malcolm, Muhammad Ali, myself and thousands of others is the Honorable Elijah Muhammad and I would hope that you will all get more acquainted with the Honorable Elijah Muhammad because God gifted us with a great man in our midst,” said Minister Farrakhan.